TPCI Valve Simulation | Triangle Pump Components Inc.
Triangle Pump Components, Inc. (TPCI) contracted Flowserve, a pump manufacturer, to compare pump valve performance using Flowserve’s proprietary PUMP-ALL software program. PUMP-ALL is a proven reciprocal plunger pump simulation program capable of predicting pump and valve performance under a variety of operating conditions, such as suction pressure, discharge pressure, and pump speed. Simulations were run testing a Durabla® 3.0” Series 8 V7F heavy spring valve with a metal disc, an Abrasion Resistant (AR) style 3.0” Series 8 pump valve, and a 3.0” Series 8 Plate valve with a Delrin® disc. The software simulated a 4.0” stroke pump using 2-3/4” diameter plungers pumping fresh water at various RPMs and suction and discharge pressures. The Durabla V7F valve with a metal disc performed at 97.8% VE producing 119 GPM. In this test the V7F functioned at (mirrored) the peak mechanical efficiency of the pump. The RESISTA™ AR valve performed at 85% VE producing 107.44 GPM. The Plate style valve with a Delrin disc performed at 95.49% VE producing 116.19 GPM. In addition to better VE, the Durabla V7F experienced less overpressure spikes than the other valves tested. The effects of continuous severe overpressure spikes can be translated elsewhere in the pump eventually leading to damaged plungers, extension rods, and power-end components. The additional strain placed on the power-end due to overpressure spikes can also result in greater power consumption as a pump requires more energy to function. 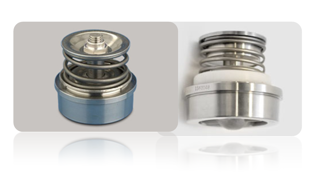 Even though the Abrasion Resistant valve had the lowest VE it still has its place in the market. The AR valve is designed specifically to operate in environments where abrasives and debris exist. The AR, with its heavy finned valve member and light spring, is designed to jet and pound abrasives and debris out of the way where these would otherwise “hang” open different style valves. Lost VE is the trade off to avoid pump down time. However, these tests indicate AR valves are not the best option in cleaner pumping environments. At Triangle Pump Components, Inc. we realize better VE equates to more fluid pumped which in turn means more revenue for our customers. TPCI is the only manufacturer of the Durabla pump valve. It is a high-quality, efficient valve. Abrasion Resistant and Plate valves are common to the pump market and manufactured not only by TPCI but also many of our competitors. TPCI has already made improvements to its spring design to enhance VE performance in its valve lines. Triangle is also employing new simulation software in order to continually improve function in all of the pump valves we manufacture. This is part of TPCI’s overall commitment to provide the best products in the market to our many customers.